We did have to get creative. We realistically couldn’t cover the entire three weeks, so Shirley’s sister offered to take the first week. Someone needed to stay at home with our son since it would be only 2 weeks into his sophomore year – so I invited my mom to join me. She also has a pocket of miles thanks to me helping her with some mini travel hacking. We both quickly booked flights for an eight night stay. It was my first time using British Airways miles to book flights on Alaska, and was pleased with the huge mile redemption savings at only 25K miles round trip. My husband however was not left out in the cold. We enlisted him to cover the last week (not a hard recruitment). The plan was for him to fly in a couple days before we flew out so we could have one full day to explore Maui together. Then he would stay solo for the remaining 6 days. I also booked him Alaska nonstop flights using British Airways miles. It worked like a charm. My mom and I arrived in Maui and got settled into their comfortable home located in Lahaina, on the west coast of Maui. We were only a 5 minute drive away from the heart of Lahaina’s Front Street, with all of its fun shops and boutiques, delicious restaurants, museums and the local theater. The dogs were adorable and happy to spend time with us. We spent our days walking the dogs at a nearby park, exploring gorgeous beaches along the west coast, trying recommended restaurants, and talking with locals and visitors alike. A highlight of the trip was when we went on a half day snorkeling adventure. I’m still a bit of a newbie when it comes to snorkeling – I had had a negative experience with it as a kid and it took me decades to work back up to trying it again. Snorkeling on Maui is legendary, so my mom and I signed up for an early morning excursion with a small private charter boat.This would have been quite spendy but we booked it for almost nothing at a tour booth on Front Street one night, by agreeing to listen to a time share presentation (always hacking, can’t help myself). We somehow not only got through the presentation without buying anything, but surprisingly had fun with the sales people and left having made a few new friends. The time spent in the presentation was well worth it. Makai Adventures is a superb tour company with incredibly friendly, helpful and knowledgable staff who not only took us to excellent snorkel spots but also provided an incredible lunch on the boat. There were only six of us on the tour, which was a far cry from the usual crowded excursion boats with up to 70 people. My mom and I originally thought we’d plan a trip to popular Molokini Crater, but we heard that neighboring island Lana’i was an even better snorkeling destination – so we went with that option. The boat left from Lahaina harbor which was a welcome convenience given that we had to board at 7:30 am. The boat ride over to Lana’i took almost an hour, then we spent about 2-3 hours snorkeling and exploring. One location in particular completely blew our minds. It was so clear we could see the ocean bottom 100 feet below us. There were literally hundreds of colorful fish darting around us and I loved watching our guide Kerstin elegantly dive to the bottom to find treasures for us to examine up close, such as a pillow starfish. We greatly enjoyed the morning, snorkeling at multiple locations, eating lunch and learning about Maui and Lanai’ history. It was an incredible and unforgettable experience. Other highlights during our stay on Maui was driving down to explore southern beaches, going to see the popular and beautiful Ulalena show at the local theater (again discounted because of that time share presentation), visiting the gorgeous Ritz Carlton Kapalua hotel and eating at an incredible sushi restaurant on their property, going to local farmers markets, and just relaxing. My husband went on a few of his own adventures – driving up into the mountains in search of photography locations and taking the dogs with him everywhere he went. All in all the trip was a great success. I’m a big believer in pursuing unique opportunities – even if they may seem a bit out of reach at first. I’m racking up frequent flier miles to use them, not just hoard them. My motto is travel now, not later. Life is short. So collect those airline mile and hotel points, put your travel intentions out there, keep your eye out for unique ways to travel and stay for free, and be creative and flexible when those opportunities come up (and they do). Who knows? You too may find yourself dog sitting in paradise someday soon. This was more of a relaxation and dog care focused trip – so I don’t have a long list of things to do/see. We just enjoyed the sun and local beaches more than anything else. But for what it’s worth, here’s my short recommendation list if you are staying on the west coast of Maui, near Lahaina. Go on a snorkeling/dolphin excursion. 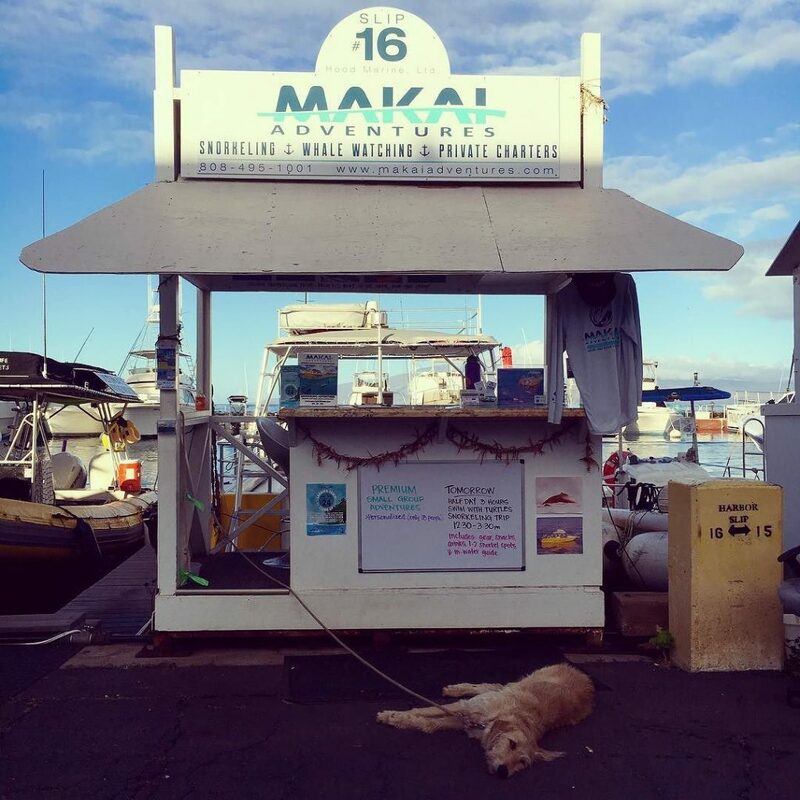 Makai Adventures is a great option for a morning or afternoon out on the ocean. Learn how to surf with Hang Loose Surf Club – my husband did this one morning and had only good things to say about Abner, the owner and one of the instructors. We loved seeing Ulalena, a beautiful and unique theatrical depiction of the history of Maui and it’s peoples. It blends traditional Hawaiian dance and music with a modern aesthetic – both my mom and I greatly enjoyed the production. Visit Front Street in Lahaina – plenty of boutiques and shops to explore (especially fun to shop for a new swimsuit). Be sure to get some gelato at one of the local delicious gelato stores. Visit Lahaina’s small museums – like the Wo Hing Museum which explores the history of Chinese immigrants on Maui, or the Baldwin Home Museum which offers a look at what missionary life was like on the island. Visit one of the many farmers market that happen almost daily on Maui. Visit the Maui Tropical Plantation. I didn’t get a chance to go here but I really wanted to. It offers restaurants, plantation tours, shows and more. This is the one located at the Kapula Resort – next to the Ritz Carlton hotel. Absolutely incredible – a must try! They have delicious and unique offerings, and also have an extensive gluten-free menu which I appreciated. Very small “hole in the wall” mexican restaurant off of Front Street in Lahaina. Run by a family from Oxaca, Mexico – it’s delicious, affordable and very quaint. I actually liked Chilangos better for regular dishes, however this place has incredible water view seating and is an ideal place to get drink at sunset. They also have wonderful desserts – try their gourmet root beer float made with local root beer and vanilla gelato! 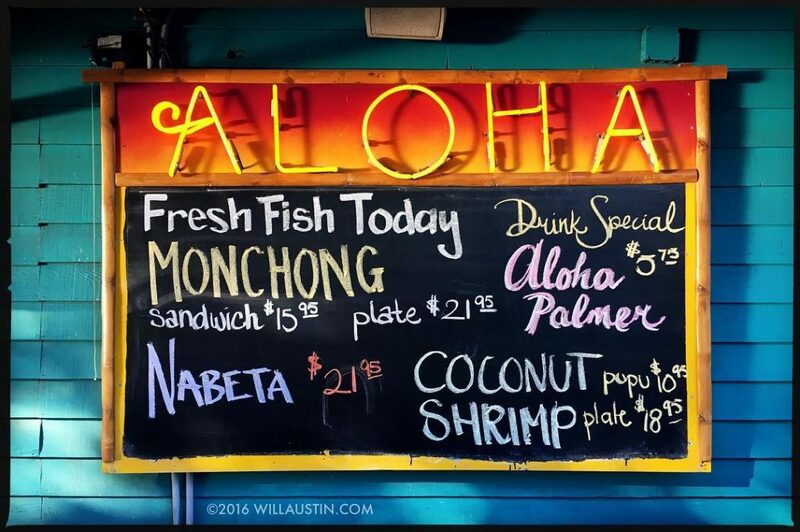 Good place to try local Hawaiian cuisine. My husband raved about this place – he definitely recommends and suggests trying their signature mixed plate. Also another great place to watch the sunset. My husband tried this place and absolutely loved the food. He said they also have a great store to explore. Not a restaurant (or a farmers market), but instead a grocery store. I’m including here because it’s a local favorite, with great fresh local produce and reasonable prices. Really great beach with good snorkeling and nice amenities (good bathroom, lots of parking, etc). I saw sea turtles while snorkeling here. Apparently have a ceremony every night at sunset w/fire torches. Also known as a good place to spot sea turtles. 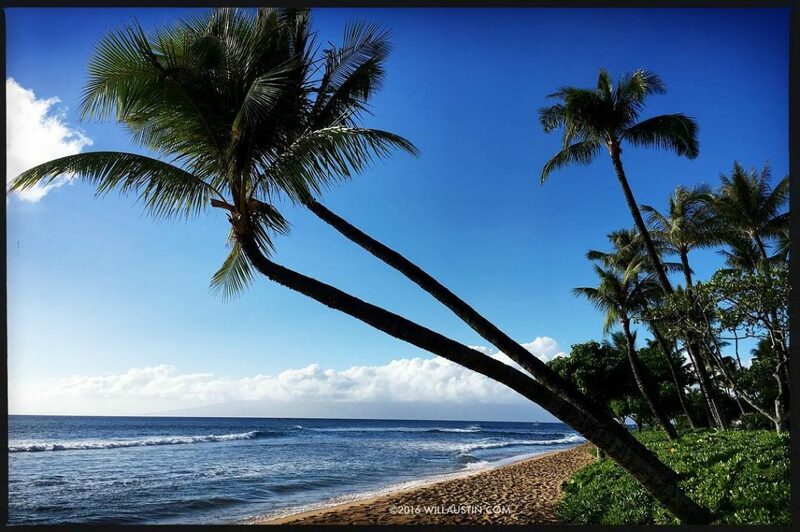 This beach was about a 45 minute drive south of Lahaina – just past Kihei. A friend recommended this beach saying it is her favorite on Maui – and I can see why. Easy entry into the water for swimming, gorgeous long beach for walking, and relatively easy to park. Highly recommend. This was recommended to us by locals – it’s an easy place for kids to swim, and a good place to learn to snorkel. There’s also a spot with a lot of trees and natural shade which is handy if you don’t have an umbrella (that Maui sun can be HOT). There aren’t facilities here so need to be more prepared going in. I’ve linked to some good information about it.